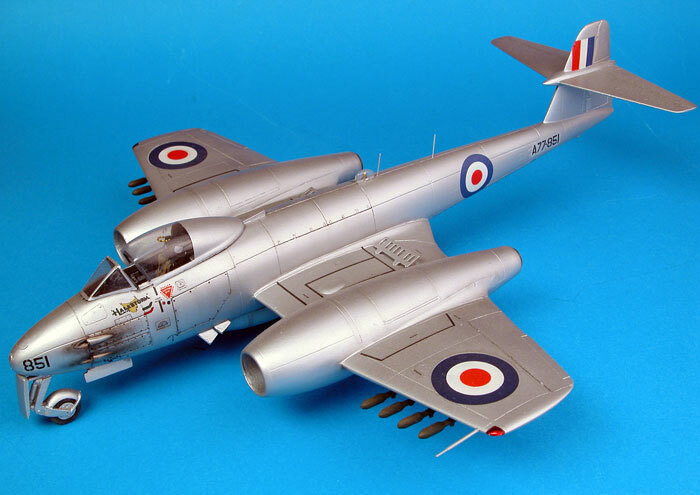 I built Aeroclub's 1/48 scale vacform Meteor F.8 back in 1999, five years before the Classic Airframes kit became available. I recently took some new photos of the model and decided to share them in this new Gallery. The kit is cleverly designed with a number of multimedia elements. 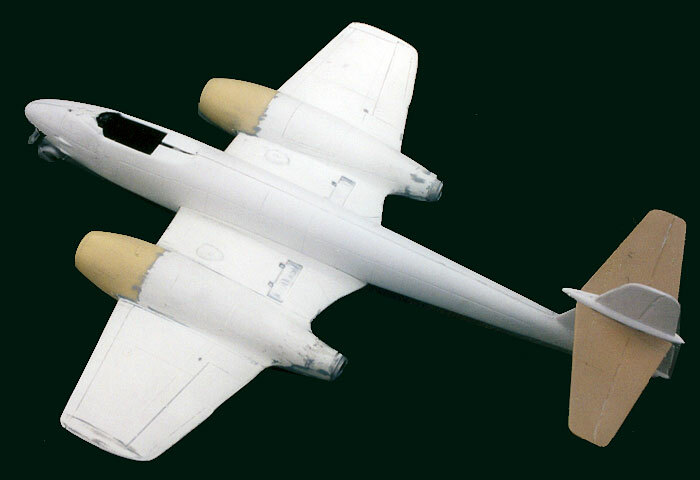 These include white metal cockpit and landing gear details, injection moulded tail surfaces and resin intakes. The key to successfully building any vacform kit is preparation. The parts were outlined with a black pen while they were still on their backing sheet, then scored with a scriber before being snapped out and sanded flat. The total time required for preparing the vacform parts was less than an hour. Care was required with alignment due to the absence of locating guides, and some filling and sanding was required, but there was nothing especially tricky about construction. I thermoformed the blister for the radio compass from clear acetate using a shaped piece of styrene strip at the master. My third attempt gave me a satisfactory result. 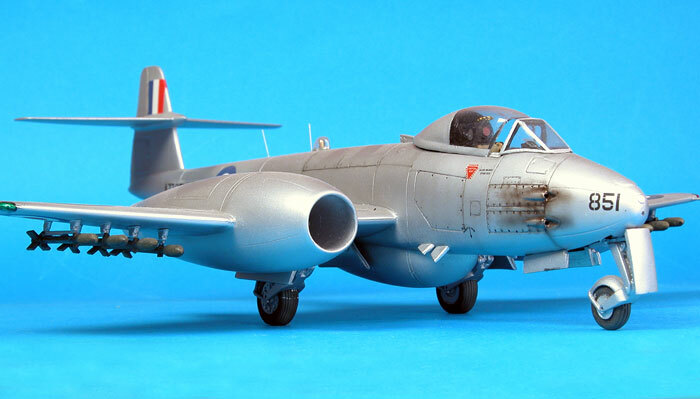 Rocket rails were borrowed from a Hasegawa Mustang, and the rockets themselves were adapted from items supplied in the Airfix Mosquito kit. Fine brass wire was used to represent the antennae. A circular and an oval panel to the extreme nose of the aircraft. A number of panel lines were obscured after filling and sanding, especially around the engine nacelles and jet nozzles. The last task before painting was to rescribe these panel lines. 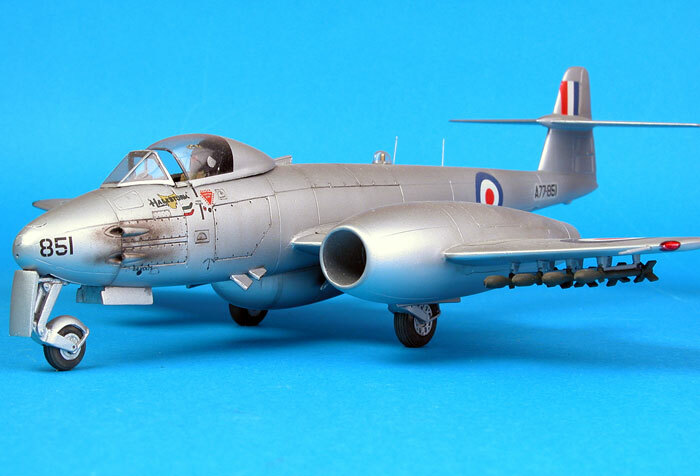 The model was prepared for painting with a flat grey base coat - Tamiya's Surface Primer. This primer coat was sanded and polished before Tamiya AS-12 Airframe Silver was applied, again straight from the spray can. 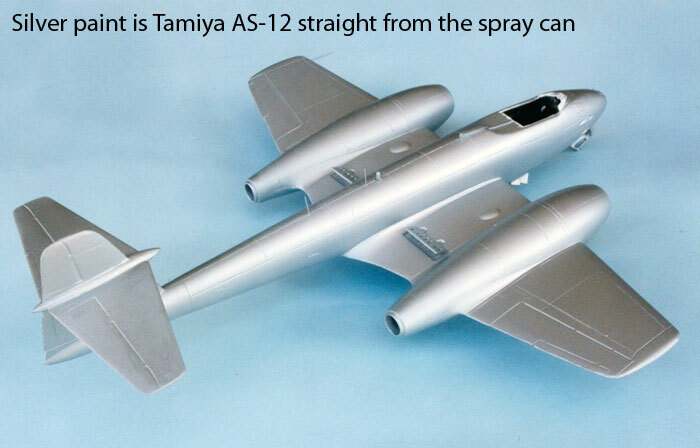 Tamiya's AS-12 colour is an excellent representation of a silver paint finish. Aeroclub's national markings and walkway lines were used, while the 77 Squadron RAAF "Halestorm" markings were sourced from a PD Decals sheet. Chris Wauchop saw the model when it was finished and decided it needed some extra cordite staining around the gun ports. How could I refuse an offer like that? Chris used his usual thin mix of Tamiya Red Brown and Black to add these stains to the nose of the model. If you would like to read about the build in more detail, you can see the original Construction Feature by following this link.